Jet skiing on the amazing turquoise waters of the Turks and Caicos. Jet ski tour in the Turks and Caicos. The Turks and Caicos offers an incredible environment for jet skiing, with white sand beaches, crystal turquoise water, and amazing lagoons to explore. Grand Turk has several jet ski companies, with both hourly rentals and guided tours. 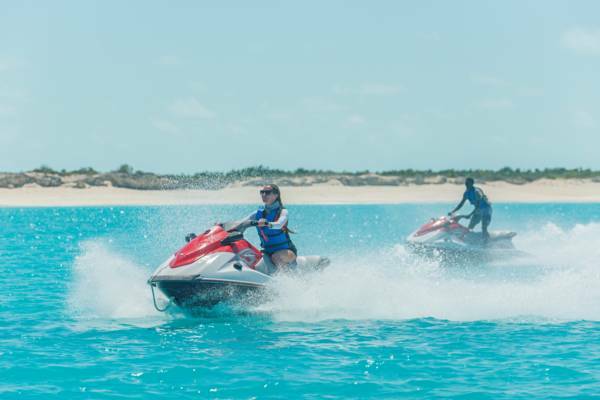 In the Turks and Caicos, jet ski use isn’t permitted inside of protected areas, including national parks and nature reserves. Almost the entirety of the west coast of Grand Turk is part of the Columbus Landfall National Park, which includes the Cruise Center Beach fronting the Grand Turk Cruise Center, Governor’s Beach, Cockburn Town Beach, Pillory Beach, and English Point Beach, wherein jet ski usage isn’t allowed. Jet skis typically launch from White Sands Beach. The primary jet skiing attraction of Grand Turk is simply the exquisite ocean water. The crystal-clear blue and turquoise hued water is breath-taking and fun to race across. For those looking for more of an adventure, a guided tour to the pristine island of Gibbs Cay is amazing. This small yet spectacular uninhabited island offers a perfect white sand beach, and friendly stingrays which swim up to greet visitors. The southern brown stingrays here flock to vessels, and it’s a great experience to snorkel in the shallow and calm water with these docile creatures. Gibbs Cay offers incredible views from the bluffs at the centre of the island, and vibrant snorkelling reefs surround the area. Long Cay, found a little south of Gibbs Cay, is another consideration. This uninhabited and pristine island isn’t visited very often, yet the lee side of the cay offers a great expanse of sheltered and flat water. There are reefs, beaches, and ocean cliffs to discover. Due to the distance, it’s advisable to only visit with a knowledge guide. Jet ski rentals on Grand Turk largely cater to cruise ships guests. Due to the fact that the beach near the cruise port is inside a national park, jet ski typically operate from White Sands Beach, which is found less than half a mile east on the other side of the island, and across Hawkes Nest Sailna. The water off of White Sands Beach is directly exposed to the typical east-southeast trade winds, so ocean surface conditions can be a little choppy, with 1-3 foot (.3-1m) waves. Check the wind, tide, and swell forecast for more information. Yamaha Waverunners are the most common rental machine on the island, and are great for beginners and experienced riders alike. Waverunners are very stable jet skis, yet are also quite fast and responsive. Jet ski rentals are typically available in 30 minute or 1 hour increments, with rates starting at about $100 per adult. Guided tours will typically be of longer duration. Rentals can typically be arranged directly on the beach after arrival on Grand Turk, yet we recommend making reservations in advance to ensure availability. In the case of guided tours, we advise making reservations prior to arrival. No prior jet ski experience is typically required. Jet ski drivers must be a minimum of 17. Persons under 17 are able to ride as passengers. PFDs (life vests) are required to be worn at all times. Last reviewed by an editor on 29 November 2018.